Moorestown coach Shawn Anstey (right) and star senior Nick Cartwright-Atkins share a smile after the Quakers' final game of a championship basketball season. Start with the sounds in the locker room. The buzz of the clippers, the hoots and hollers of the players as their coach’s hair fell to the floor. Start there, with Moorestown coach Shawn Anstey sitting on a bench as guard Vinnie Caprarola — a three-sport senior whose versatility apparently extends to an ability to work in a barber shop — created a mohawk design on the coach’s head. “It was hilarious,” Moorestown senior guard Jagger Zrada said. Moorestown senior Nick Cartwright-Atkins (left) admires the Mohawk-style haircut that coach Shawn Anstey sported after the team won the Group 3 state title. Here’s the thing: It was part celebration, part preparation. 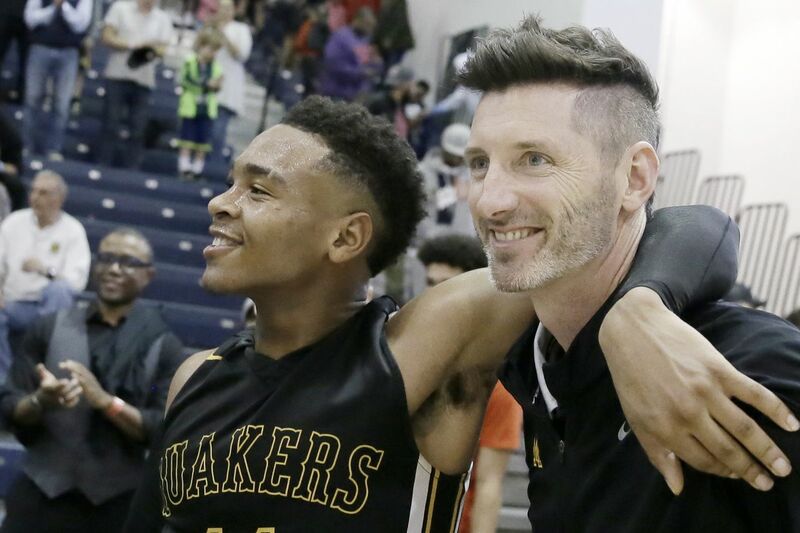 The Moorestown boys’ basketball team that afternoon was playfully insisting its coach honor his long-broken promise to get his hair cut in their playoff style in another joyful reaction to the program’s first state championship in 60 years. The Quakers also were a couple hours away from taking the court for the first round of the Tournament of Champions and beating favored Haddonfield in perhaps the signature victory of the entire dream season. Strange as it might seem, that scene is the best explanation as to why Anstey is the Inquirer’s South Jersey coach of the year in boys’ basketball. In his 10th season, Anstey and his assistants led a team with a 6-footer who jumped center and a gritty bunch of multi-sport athletes – none of whom is likely to play college basketball at any level – to the Group 3 state title as well as an exclamation point of a victory over the Group 2 state champions. The Quakers were a classic team in the sense that the whole was greater than the sum of the parts. Take the squad apart player by player – from Cartwright-Atkins, the 6-foot football recruit who flourished in the paint, to the 5-foot-9 (maybe) Zrada to consummate role players such as Caprarola and fellow seniors Akhil Giri, Brian McMonagle and Tommy Londres, among others -- and the pieces don’t add up to a state championship team. In his 10th season, Shawn Anstey led Moorestown to a 28-6 record and the Group 3 state chanmpionship. But there was something special about the Quakers. They made the extra pass on offense. They were diligent on defense. They sacrificed playing time without complaint. They knew their roles. They were focused but loose, a tricky combination. That’s a tribute to a lot of things, including the team-first approach, competitive fire and complete commitment of the athletes. But that’s culture at its best. That’s coaching most of all. Anstey and his assistants – Lorenzo Eagles, Mark Caprarola, Tom Smith and Matt Emerson -- led a team that walked on the court, game after game, looking pretty average – lacking in height, lacking a classic scorer, lacking a lot of things. Eighty minutes later, they walked off the court, usually after another victory. Moorestown coach Shawn Anstey is about to get a ride from star senior Nick Cartwright-Atkins after the Quakers won the Group 3 state title with a 58-44 victory over Ramapo at Rutgers University. Starting on Feb. 4, the Quakers won 15 in a row. They beat sectional finalists Willingboro, Cherokee and Burlington City. They cruised through the South Jersey Group 3 tournament, winning four games by an average of 19.5 points. They were even more impressive in the state tournament, beating Central Jersey champion Wall Township by 20 and North Jersey champion Ramapo by 14. And they capped it off with a 60-59 win over Group 2 state champion Haddonfield in another clinical display of team basketball at Toms River North. That victory came a few hours after Anstey, at long last, kept the promise he had made before the start of the state tournament. Actually, he said he would agree to a mohawk if the Quakers won a sectional title. But he reneged, claiming he was due to pose for a “family photo" shoot.